“Newroz has been celebrated for roughly 5000 years in these lands” said Gülnaz Beyaz, an Ezidi woman in traditional dress who came all the way from Germany to participate in the Mesopotamian New Year’s festivities in Diyarbakir (Kurdish: Amed). 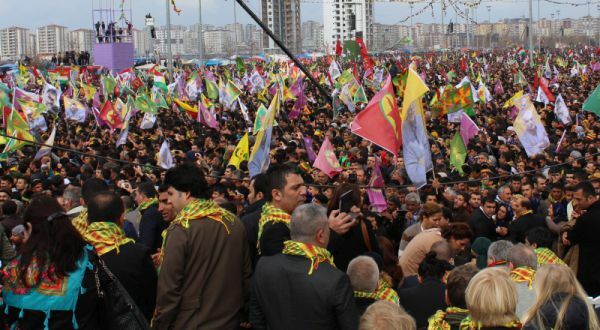 Later on 21 March, co-mayor Fırat Anlı of Diyarbakır, the biggest city in Turkey-Kurdistan and the symbolic capital of the Kurdish political movement said: “This year we have celebrated Newroz for the 2627th time. Since 612 B.C. it has been celebrated here.” However, whereas for most of these either 2627 or 5000 years, the end of the winter, the coming of spring and the beginning of a new year was celebrated together with the mythological liberation of Kurds from tyranny by the blacksmith Kawa, in recent years, Newroz in Turkey has turned into a PKK/Öcalan festival. The slogan chosen for this year’s main Newroz celebration, which was placed above the stage on Newroz square in Amed, was “It is enough. Freedom for leader Öcalan.” Öcalan has been serving a life sentence since 1999 on an island in the Marmara Sea. From this island, Imralı, he sent, as he did in 2013, a letter to be read out during Newroz. Whereas in 2013, his statements started the latest ceasefire of the PKK and a negotiation process between him and the state, which began with great hopes in the summer of 2013, but has so far not led to any tangible results. On Saturday, Öcalan’s message was more a repetition of what was already announced in February by MPs of the HDP, the political party of the PKK movement, in a joint meeting with interior minister Ala and AKP’s negotiator Yalçın Akdoğan, The most important aspects of this so-called “Dolmabahçe meeting”, the sultan’s palace at the Bosporus, were 10 very broad and general points concerning democracy and civil rights in Turkey and that the PKK should convene a congress. Öcalan repeated his idea for a monitoring commission and the formation of a truth and reconciliation commission to be set up by parliamentary members and the monitoring commission. 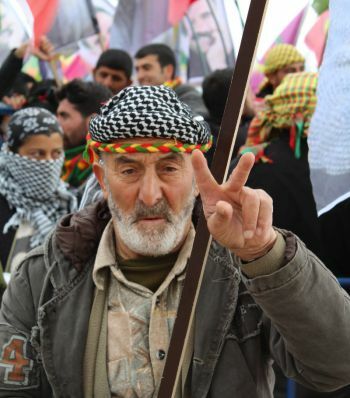 If this were done, the PKK would hold a congress, which would mark the beginning of a “new era”, in which the PKK would declare the end of the armed struggle within the borders of Turkey. However, this is not equivalent to a laying down of arms per se, because the PKK has also been fighting in Iraq and Syria and will continue fighting there, especially against IS. Öcalan made clear that he still believes in the negotiations with the state and that a collaboration between the PKK movement and the state is possible. Therefore he referred to the “soul of Eşme”, the place in Syria where the grave of Süleyman Shah was transferred by the Turkish army in collaboration with the YPG, the PKK affiliate in Syria. The whole process is being orchestrated by Öcalan and the state. The political party HDP with currently has 29 deputies in parliament and many mayors in the majoritarian Kurdish provinces, has only a background role, as messengers between Öcalan, the Qandil mountains and the state. 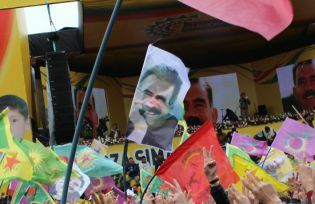 This insignificance was also very obvious during Newroz, the flags waving on the square were different versions of Öcalan (young and old) and PKK flags and symbols, the most often heard slogan shouted by the crowd was “Without the leader there is no life”. The saddest moment of the day was, when elected Diyarbakır mayor Gültan Kışanak took the stage. It was among the quietest minutes of the roughly five hour festivities with the crowd whistling and booing. Kışanak does not know Kurdish and is not from Diyarbakir, two factors, which do not help her popularity. To avoid the embarrassment of only speaking Turkish to the crowd, she memorized some slogans in Kurdish like “Newroz is the day of resistance … it is a day symbolizing the liberation of women … greetings to the mothers, greetings to Rojava/Kobane” and the like. An eloquent intelligent woman who was imprisoned and tortured for her political ideas has been reduced to a shouter of slogans. This year’s Newroz was also part of the campaign for the parliamentary elections on 7 June. Many potential HDP candidates were present. Because the party will run not with independents, but as a party in all 81 provinces, many of the candidates this time will be non-Kurds. If the party surpasses the 10 percent threshold, many non-PKK affiliated MPs will enter parliament. This would help transform the party from an exclusively Kurdish party to a centre-left, liberal, secular and multi-cultural/religious party and initiate an emancipation from the PKK. 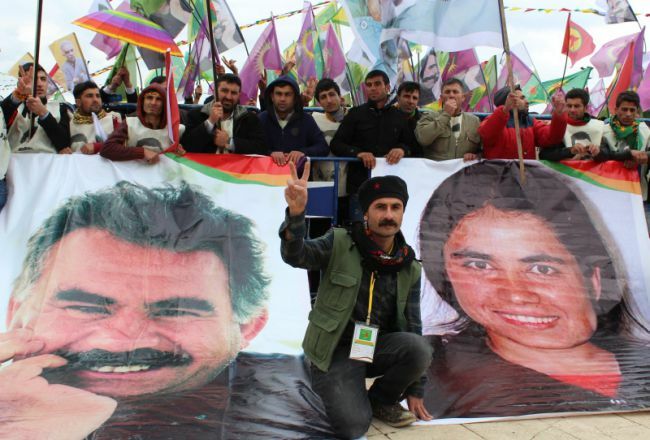 With a successful peace process and changes to the prison conditions of Öcalan, then Newroz could become what it was for most of its thousands of year old history. A feast to celebrate the arrival of spring.